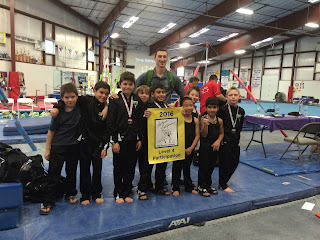 The Gymnastics Zone Boys Junior Olympic Team led by head coach Mike Terhorst. 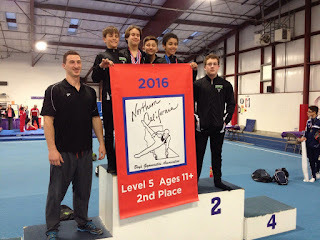 The boys competed in USA Gymnastics Mens Level 4 and 5 State Championships on March 12 & 13 hosted by and held at Performance Gymnastics in San Luis Obispo and returned from San Luis Obispo with a two-event state champion, a qualifier to the State All-Star Team and another notch in their belts as second place boys team in Northern California. Gabriel Deeik – seventh on pommel and fourteenth all-around with a score of 53.300. Riley Grinnell – seventh on floor, eighth on pommel, fourth on rings and twelfth all-around with a score of 55.800. Thomas Malloy – fifth on pommel, ninth on vault, eighth on high bar and fourteenth all-around with a score of 55.600. Ethan Exum – sixth on parallel bars and fifteenth all-around with a score of 55.500. Mario Delanni – seventh on rings, eighth on parallel bars and sixteenth all-around with a score of 55.100. Orion Seal – ninth on vault and tied for eighteenth all-around with a score of 54.600. Leonardo Deeik – eighth on pommel and tied for eighteenth all-around with a score of 54.600. Matthew Payne –twentieth all-around with a score of 53.400. Logan Nations – twenty-second all-around with a score of 50.200. Petar Zivkovic – second on floor, second on pommel, third on high bar and third all-around with a score of 60.200. Lukas Rieken –fifth on floor, fifth on pommel, sixth on rings, fifth on vault, second on high bar and fifth all-around with a score of 58.750. 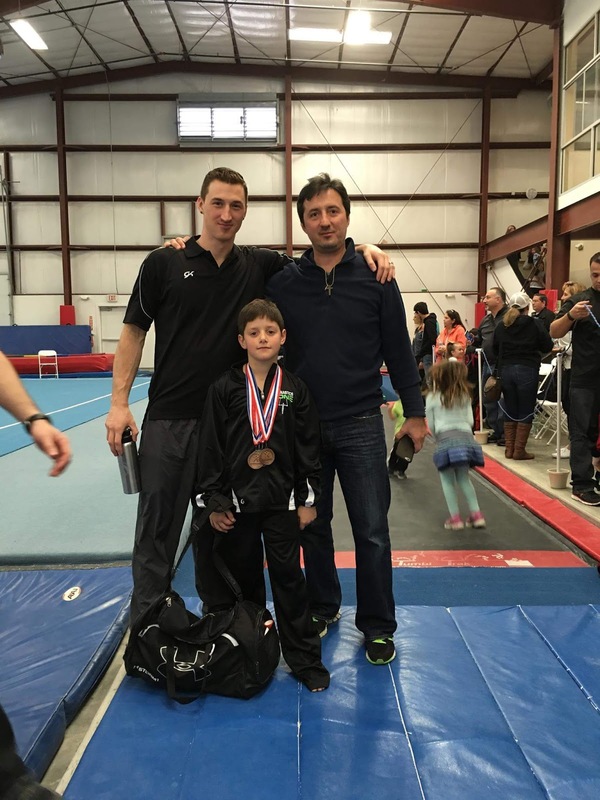 Liam Wallace Harper –fourth on floor, sixth on pommel, third on vault, ninth on parallel bars, fifth on high bar and seventh all-around with a score of 58.250. Eamonn Weinstock –sixth on pommel, sixth on vault and fourteenth all-around with a score of 54.550. Noah Pack –first on floor (State Champion), first on pommel (State Champion), second on vault, third on high bar and third all-around with a score of 59.900. Emilio Delanni – sixth on vault and sixteenth all-around with a score of 53.100. The level 5 team placed second with a score of 176.900. Zivkovic, Rieken, Harper and Pack qualified for Regional competition April 6-10 at Region 1 Championships to be held at the Santa Clara Convention Center. Pack will compete on the Regional All-Star Team representing Northern California. The boys will compete against qualifiers from Northern California, Southern California, Nevada, Arizona and Utah.